Love the new converters, clock and extra DSP! Very impressive conversion on the new Apolo X this is my this third interface from UAD. Thank you for a quality product!!!! From the first moment of hearing the quality and fidelity of the first audio signal coming through the Apollo A to D converters - I was a convert. From the time of opening Strongroom Studios in London UK, in 1984, through to me installing the UA in my newly expanded Sweet Factory, this is the best sounding audio I’ve heard. Don’t start me on the plugins as well! I got the apollo X16 because i needed more I/O. My next studio purchase would've been the black 16 to add with my pair of black 8's. When the X16 was released I figured it couldn't hurt to spend the extra money and get the next new thing because it had a few more nice features. The first day I added X16 to my system of two blackface 8's I had to check the clocking several times back and forth because clocking my existing Apollo system with the X16 added an impressive amount of depth and clarity to my sounds. I thought a clock wasn't supposed to do that. Just the improved clocking made a valuable difference. After wiring the majority of my outboard preamps to the inputs of the X16, tracking a band was noticeably better sounding to my girlfriend. My entire studio has been upgraded and i must admit the improvements are no joke. The X16 is what they say it is-Elite class conversion-and I like it . The Apollo X16 was an upgrade for me and It was worth every penny. The best Apollo made. Love the clock in it and the clarity this unit brings. Super device !!! Very glad I bought !!! This gear is for recording professionals. It forces you to focus on getting the best sounds into your gear by offering you not just 16 line level in/out but additional AES digital in... i use it with UA Twinfinity Preamps and a Neve 8816 summer and the results are phenomenal. I'm pretty used to there being two varieties of converter/interfaces - the ones that sound good VS the ones that function well. With this piece, the worlds have finally combined! Top of line UX matched with prestine-quality audio? Love it. The high frequency of Rme or avid hd io was different. However, the bass was heard well and the punch feeling was very good. Compared with the high-frequency antelope company's products, it's not a cool feeling, but a cool, warm feeling. It feels a bit rough analog. There is a similar feeling of burl audio and high frequency, but only the color of apollo x16. This is a more trendy tone. I used an Apollo 16 and wanted to try the X16. I am fine with the product but did not find the difference that I was expecting in order to compete with Avid or Apogee. Bigger disappointment was to discover that I had already 6 gears under one system (system 1), and had to move to a new system (system 2) for the X16, i.e. I cannot use the UAUDIO plugins that I have on system 1. I am not sure to understand why UAUDIO does this. We should be able to use our plugins with all the gears we have. It is definitely limiting and does not convince me to buy further UAUDIO gear or plugins. UAUDIO must have a commercial reason-only for this approach. I started with the original firewire Apollo in 2012 which I loved for the workflow but I felt the conversion was a little gritty in the midrange. I jumped on the MKii Model as soon as it came out opting for the 16 mkii which was a HUGE step up conversion wise. I still felt my Dangerous Dbox was was slightly better for monitoring but the DA for summing was great in comparison to the silver face apollo. 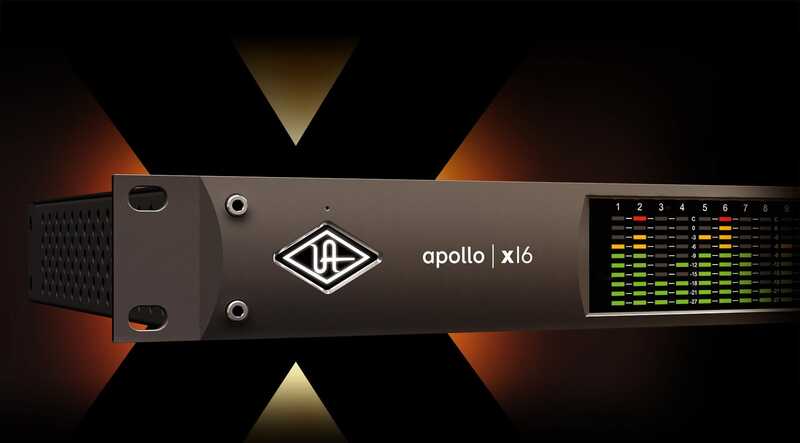 So now the apollo x16 comes and again I upgrade immediately and again I nice step up. I will say that It competes with my Dbox for monitoring. I have it running with an Api 1608 and I will say that the dynamic range and the +24 operation is a welcome upgrade as I think it sounds better with the console. Did I NEED to upgrade. Probably not. I love the mkII and still have one in my Philly Studio. The extra dsp is also welcome. Wish it was a full Octo but I bought this for the conversion. I will definitely be purchasing a second one in the future. Big step up in the monitoring, I can hear a lot more definition in my music. Have been using UA since 2013, these guys are always ahead of the curve. Upgraded unit overall. Perfect for studios with plenty of outboard.